LONG BEACH, Calif. /California Newswire/ — Art-In-Relation (A.I.R. 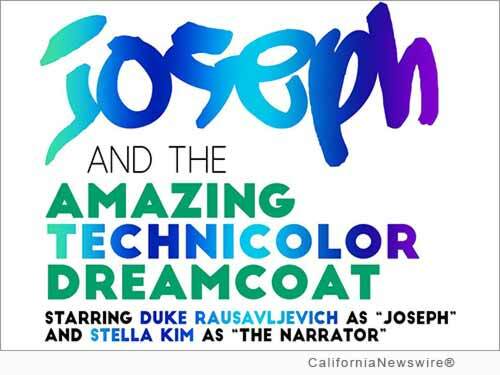 ), Jonas Sills and Ray Buffer, producers are proud to present their sixth stage production in a unique version of Andrew Lloyd Webber's classic, "Joseph and the Amazing Technicolor Dreamcoat" for a limited run from August 14-23, 2015 in Long Beach, Calif. This classic Andrew Lloyd Webber Musical will be presented in an equally classic setting, the stunning Ernest Borgnine Theater, nestled in the heart of downtown Long Beach in the Scottish Rite Cathedral. First presented as a 15-minute pop cantata for a children's school in London, this updated musical production by A.I.R. is focusing on the classic story and using youth in a unique way. Ray Buffer's vision doesn't just have the children observe the story forward, standing on risers behind the action, but makes them an important part of it, and even has them participate, as each young member becomes a part of the adventure and ponders the lessons of the classic story of Joseph and his "colorful coat." A.I.R. is featuring local performers Stella Kim (Narrator), Quentin Garzon (Pharaoh), and Duke Rausavljevich (Joseph) as well as a cast of over thirty. Duke is excited to portray this role because it not only reflects his passions as a performer, but also his spiritual ones, "The story of Joseph is very truly told in this rendition by Tim Rice and Andrew Lloyd Webber," says Duke. "It is a family event, appropriate for children, but also has wonderful, fun comedic and stylistic references for the adults in the audience." As A.I.R. 's co-producer, Jonas Sills was excited about this production because it brings together his experience as a long time teacher of music in public school in Long Beach with his professional contacts in the musical theater world. "The future of the arts lies in introducing young people to music, theater and dance in a exciting, positive way," says Sills. "This production from it's inception in the late 60's to the modern day aims to do that." Joseph is presented at the Scottish Rite Cathedral, Ernest Borgnine Theater on August 14, and 21 8 p.m.; and August 15, 16, 22 and 23 at 2:30 p.m. Call 1-800-838-3006 or http://technicolor.bpt.me to order tickets. The Ernest Borgnine Theatre (a beautiful and classic mid-1920's auditorium inside the Long Beach Scottish Rite) is located at 855 Elm Avenue, Long Beach, CA 90813. There is plenty of free parking and the theatre is easily accessible from both the 710/405 and 22 Freeways and is also a short walk from the Blue Line Metro Station. Art-In-Relation (AIR) is a new not-for-profit arts organization based in Long Beach, Calif. Its focus is on providing a service to the community by bringing a mixture of the familiar with new and emerging works of musical theater, drama, and even visual and healing arts, performed by a "collaborative" combination of professionals as well as new and emerging talent. AIR will be opening a special boutique and art gallery in downtown Long Beach in late August. More information: http://www.artinrelation.com/ or https://www.facebook.com/artinrelation/.